Agreed! But I think the question of whether these “moderates” are consistently moderate across the board or whether they are moderate on some issues and more extreme on others matters. Issue weighting matters–people who are moderate on some issues (or closer to the status quo) and extreme on others will care more about those on which they are more extreme. This affects voting behavior, which is ultimately what matters. The big question remains why these moderate pluralities don’t translate into moderate policies. Some (Fiorina) see this as a disconnect. But I think that it’s simply because a lot of these “moderates” are willing to express moderation when a pollster calls them up and asks them what they think, but aren’t as willing as their extremist neighbors to get in their car and drive to their local high school gymnasium every other November. 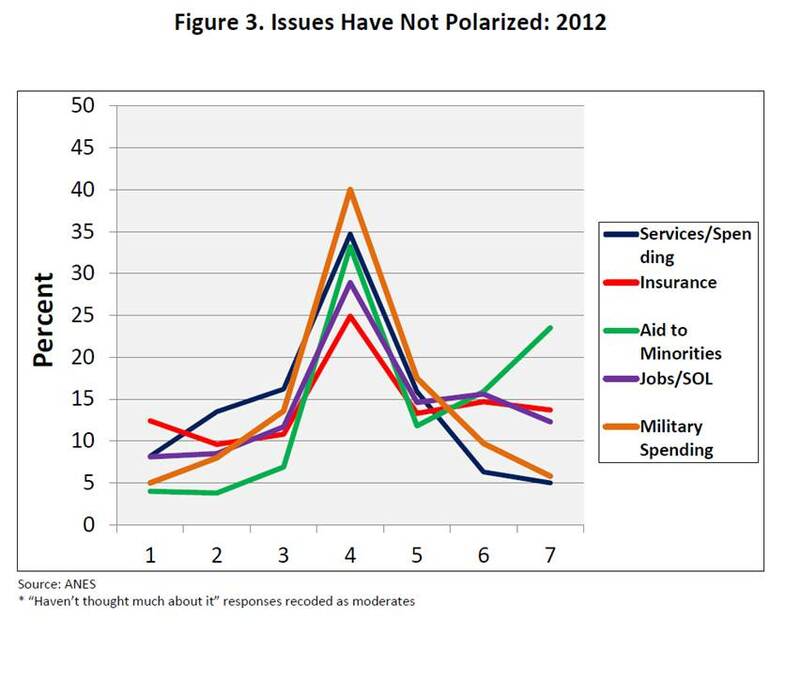 Thus it strikes me that by including “haven’t thought much about it,” the Abrams/Fiorina chart is just a tad misleading. 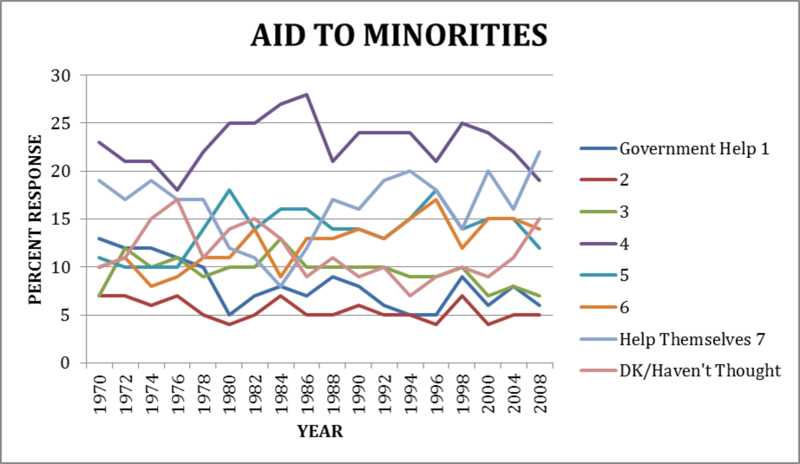 On the “aid to minorities” data set, for instance, including the “haven’t thought much about it” means that 4–the moderate option–remains the modal choice, giving us a nice central peak on the chart. 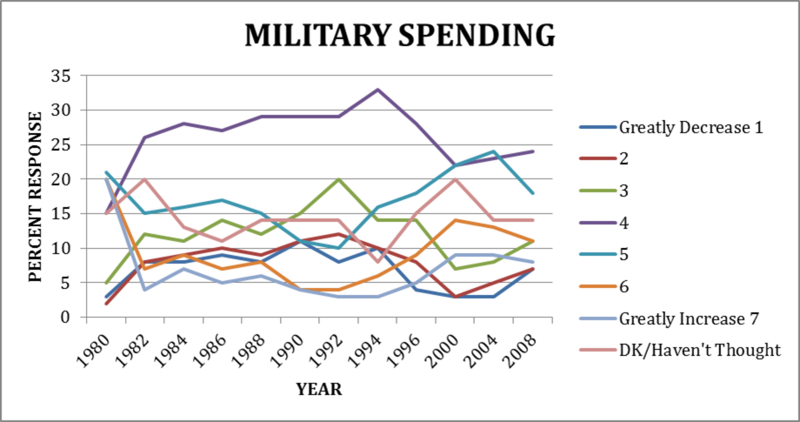 If you exclude the non-thinkers, though, 7 becomes the modal choice (see your chart above) for the 2008 data. 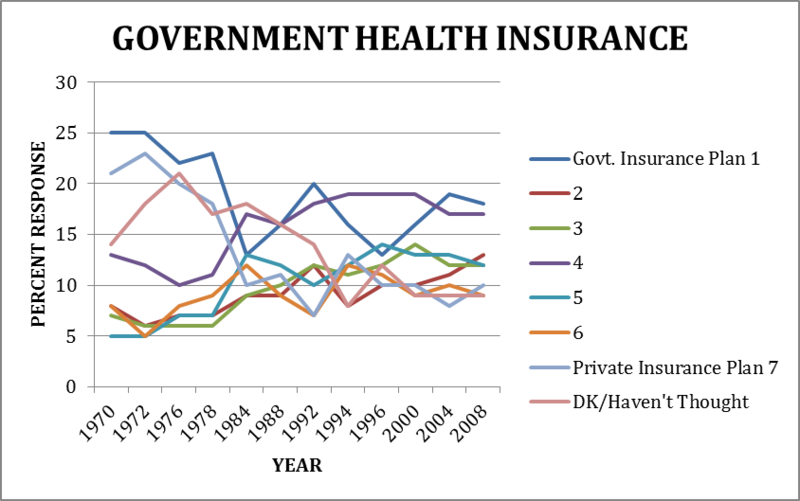 The same is true of health insurance, albeit with a 1 becoming the modal option. 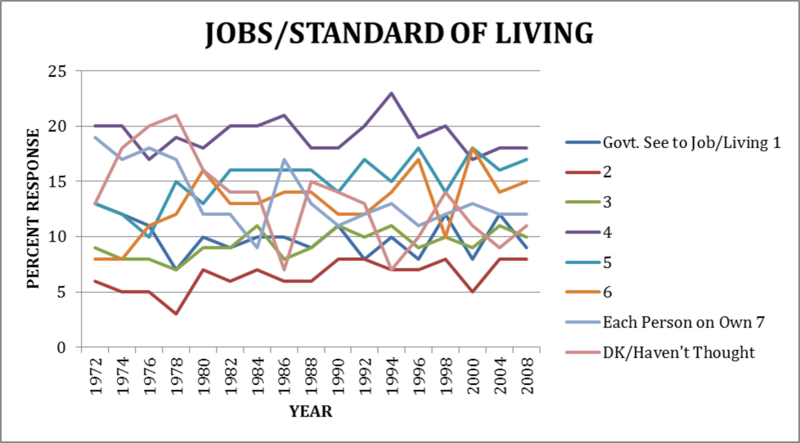 The “peakedness” of the jobs dataset would also decline, with 1 being almost as popular as 4 and 6 close behind. Counting the apathetic as moderate may make sense for opinion data, but it leads to very misleading inferences when you try to match polls with voting behavior. The apathetic who don’t think about these issues almost by definition are unlikely to decide to vote. This is the flaw I see in in Abrams and Fiorina’s work, and why I think that Abramowitz’s corrective is quite valuable. You make several valuable points. Both Abramowitz and Abrams/Fiorina would agree, I think, that those with more extreme ideologies are also more politically active, although I suspect they would differ re: the size of the activist class. Abramowitz seems to think it is bigger than does Fiorina, but again that may be a function of the way Abramowitz codes survey responses. We talked about this during our seminar, if you recall. I’m not entirely sure what you mean by Abramowitz’s “corrective” – are you referring to his index of ideology? 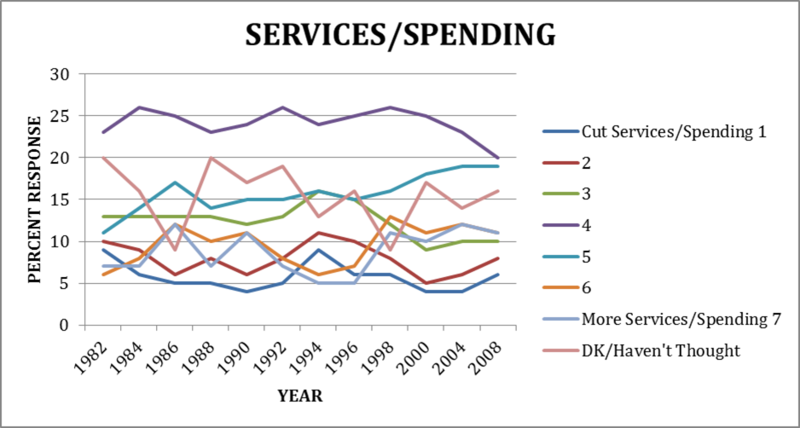 I don’t think the difference is as much about methodology as it is about views on what representative government entails–the age old dispute between representativeness and trusteeship. This is not to say that methodology doesn’t matter, but I think the heart of the dispute between Fiorina and Abramowitz is about how representation should work and who should be represented. I think you are right – Fiorina thinks politics should engage, and represent, the more numerous moderate middle. Abramowitz, I think, is fine with having our elected officials more responsive to the engaged activists among us – but again this in part because he thinks there are more activists due to polarization than does Fiorina. so methodology – how we decide who an activist is – partly colors our perspective on who is getting represented, and whether that is ok or not.